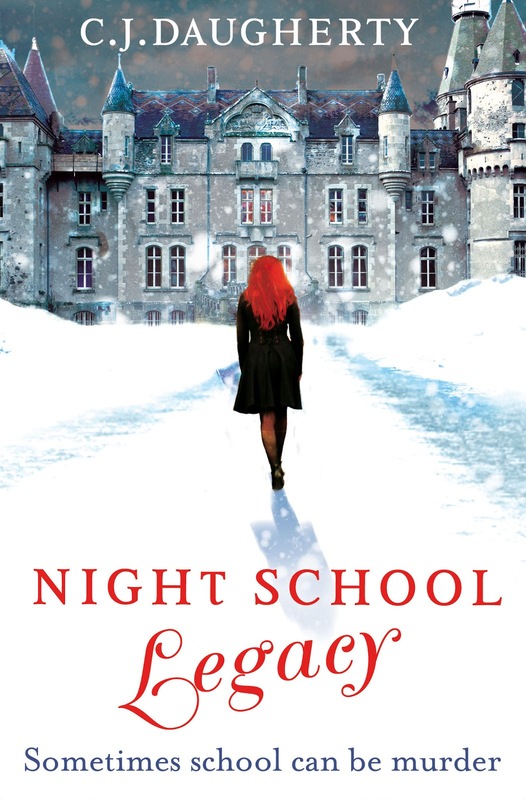 Night School Legacy is the second book in the amazing Night School series by CJ Daugherty! 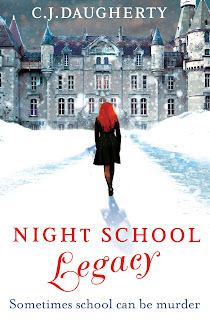 It has become one of my favourite recent series and I urge you all to pick up both Night School and Night School Legacy. 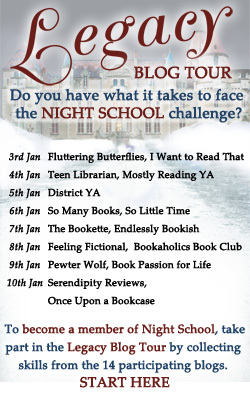 I'm hugely excited to take part in the blog tour for this book! Not only am I supporting an adopted British author and a very cool book, but there's also some really great prizes up for grabs throughout this blog tour. Most of the women who inspired me when I was young were fictional: Lucy and Susan in The Narnia Chronicles, who were both so STRONG and brave; Sara Crewe in The Little Princess, who never stopped being kind, no matter how bad things became. But I always knew they weren’t real. And for me, true inspiration came from life. The real woman who inspired me every day was Juanita Robbins, my grandmother. She was beautiful, with waves of white-grey hair tumbling down to her waist. Her Native American blood showed in her high cheekbones and her dark, piercing eyes. I’m convinced my love of reading came from her – my parents weren’t readers and there were no books in my childhood home but her home was filled with them, and she nurtured my love of learning and encouraged my desire to write. When she died at the age of 86 I inherited her journals, each one filled with an impatient scrawl so like my own. It was then I discovered the truth about her life. As a young woman she’d longed to be a writer but in her conservative southern family in the 1930s that wasn’t considered a suitable job for a woman. She couldn’t bring herself to hurt her parents so she abandoned her dreams and married a man who worked as a printer at the local newspaper – that was as close as she got to a career in letters. She grew up poor in rural Texas, an only child. During the Depression, her father lost his job and her parents couldn’t afford to feed her, so they sent her to an orphanage in Oklahoma. She was 12 at the time. In the end, it was less than two years before her father was working again and they brought her home, but she never got over it. It broke her heart. In pictures from that time, she looks like a movie star, all huge eyes and rosy cheeks, standing slim and straight, wild as a sparrow. My Great Aunt Mildred was her best friend – they are together in almost all her childhood photos. She told me Grandmother was regularly spotted by modelling agencies on the streets of Dallas but turned them all down. Like writing, modelling wasn’t something good girls did. My memories of her are more prosaic. Chasing a tarantula out of the kitchen with a broom as I stand on a chair and scream. Pulling on white “driving gloves” to protect her hands from the sun when she drove to the supermarket. Each time I saw her she’d slip books into my bag. The Lion the Witch and the Wardrobe, The Secret Garden, The Little Princess, The Borrowers… I filled an entire bookcase with my grandmother’s books. Many of them were antiques – books she or her parents read as children. To this day my bookcases are filled with old books, and there is no smell I like better than that of old paper and 19th-century ink. Later, she was the one who told me I could become a writer if I wanted to– something that, until then, I’d never even considered. Because how could a girl from a house without books write? My parents wanted me to go into banking. Thank God for grandparents who understand their grandchildren better than their parents ever could. And thank God in particular for Juanita Robbins. My hero. 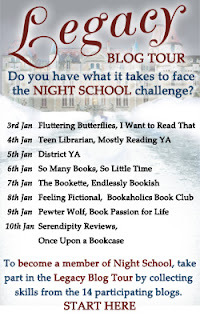 Thanks for this-I loved Night School, and I really want to read Night School Legacy! Thanks so much CJ, for that fab guest post! So glad you went down the route you did and not into banking..